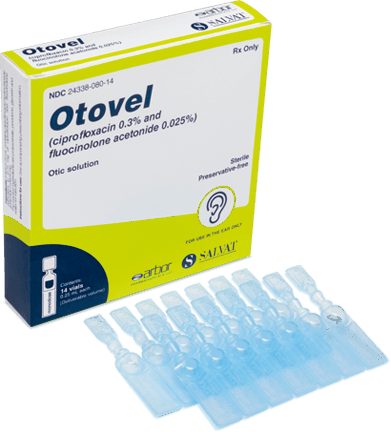 Patients with known hypersensitivity to fluocinolone acetonide or other corticosteroids, ciprofloxacin or other quinolones, or to any other components of OTOVEL. 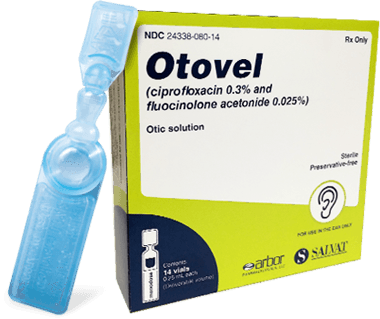 OTOVEL® (ciprofloxacin and fluocinolone acetonide) is indicated for the treatment of acute otitis media with tympanostomy tubes (AOMT) in pediatric patients (aged 6 months and older) due to S. aureus, S. pneumoniae, H. influenzae, M. catarrhalis, and P. aeruginosa. Hypersensitivity Reactions - OTOVEL should be discontinued at the first appearance of a skin rash or any other sign of hypersensitivity. Serious and occasionally fatal hypersensitivity (anaphylactic) reactions, some following the first dose, have been reported in patients receiving systemic quinolones. Some reactions were accompanied by cardiovascular collapse, loss of consciousness, angioedema (including laryngeal, pharyngeal or facial edema), airway obstruction, dyspnea, urticaria and itching. Serious acute hypersensitivity reactions may require immediate emergency treatment. Potential for Microbial Overgrowth with Prolonged Use - Prolonged use of OTOVEL may result in overgrowth of non-susceptible bacteria and fungi. If the infection is not improved after one week of treatment, cultures should be obtained to guide further treatment. If such infections occur, discontinue use and institute alternative therapy. Continued or Recurrent Otorrhea - If otorrhea persists after a full course of therapy, or if two or more episodes of otorrhea occur within 6 months, further evaluation is recommended to exclude an underlying condition such as cholesteatoma, foreign body, or a tumor. The most common adverse reactions that occurred in 1 or more of the patients are otorrhea, excessive granulation tissue, ear infection, ear pruritus, tympanic membrane disorder, auricular swelling, and balance disorder. For additional safety information, consult the Otovel full Prescribing Information. References: 1. OTOVEL [package insert]. Atlanta, GA: Arbor Pharmaceuticals, LLC. 2. US Food and Drug Administration. Orange Book: Approved drug products with therapeutic equivalence evaluations. https://www.accessdata.fda.gov/scripts/cder/ob/default.cfm. Accessed July 15, 2016.